It’s not in English. It’s not in Italian. The scene opens with two men united by a common and unique destiny: staging ”Waiting for Godot” by Samuel Beckett. Confused by a confusing play, the two improvised actors approach the script with the same naiveté of two clowns playing a Greek tragedy: in the wrong place at the wrong time, but with the certainty to be in the right place at the right time. Their big dream is to play it at Théâtre de Babylone in Paris, near the legendary Quartier Latin, where it was historically staged/played for the first time. With few resources, they prepare themselves, making their best efforts to fulfil their wish. They rehearse for days, months, years, with obstinacy and naiveté, making mistakes (a lot) and learning (a little), until the magical day: the time of their debut has come at last, however they haven’t understood anything about it. They stop playing, they get confused, they get lost in the complexity of the text that they do not yet manage to control. Quando, Quando? is a tragicomic journey of two blunderers playing with their dreams and their fears by comparing themselves with the theatrical pair par excellence: Vladimir and Estragon. Alberto Ierardi and Giorgio Vierda carry on their research about the meaning of the theatrical pair, that, through the staging of Quando, Quando?, is augmented through the language element: the play is indeed written in a mix of languages. By taking advantage of the inherent multilingualism of Waiting for Godot text (Beckett initially writes it in French and later on he re-translates it into English), on the stage the actors play their characters by using the following three languages: English, French and Italian, hence creating a musical score. The challenge to create a real European grammelot intends to be an expedient to actively reflect on the use of language in our daily life and on how the same may serve, according to its declinations, as a common ground or as a source of conflict with other cultures. La Ribalta Teatro is an Italian Company, formed by a duo, Alberto Ierardi and Giorgio Vierda, both graduated at Nico Pepe Academy in Udine. 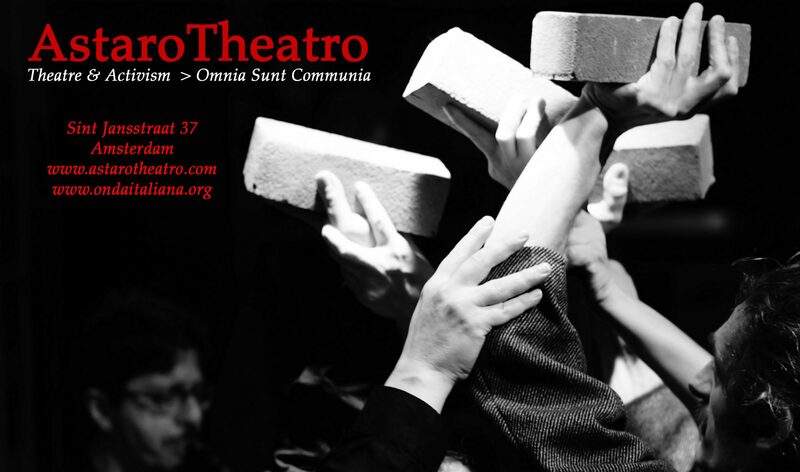 Winner of many prices in Italy, La Ribalta Teatro is giving now the birth to its fresh European Tour with Quando, Quando? It works in Pisa at the “Teatro Lux”, where it is based. At “Teatro Lux” it creates its shows and gives many workshops for the citizens. This entry was posted in Uncategorized on 28/09/2017 by astarotheatro.